Pitch Black 12 finishes officially today and soon the skies over Darwin will once again be the semi-exclusive province of the commercial pilots. No more formation flying or military jets going “hell for leather”. As a finale I wanted to show you a few shots of various planes coming in to land over Coconut Grove. The carpark on Totem Road was a popular viewing spot. 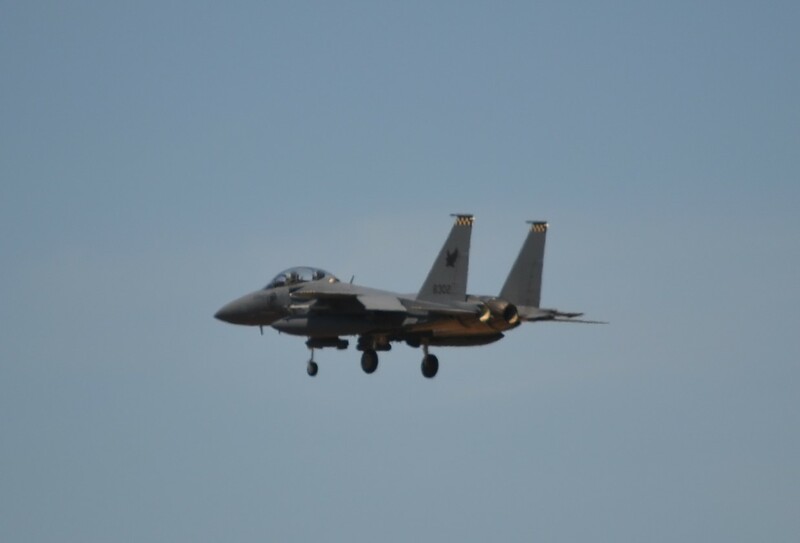 RSAF Military Jet: I think it’s the F-15 Eagle. Not a sharp enough pic really. The RSAF again but not sure which aircraft. Any advice? If I’ve got the identification of these aircraft incorrect I’ll happily make the correction – please leave a comment by clicking in the bubble beside the title of the post. For those of you who aren’t into planes, you’ll be pleased to know tomorrow will be a return to more cultural matters with images from the Darwin Aboriginal Art Show last weekend. As much fun as the planes only different. 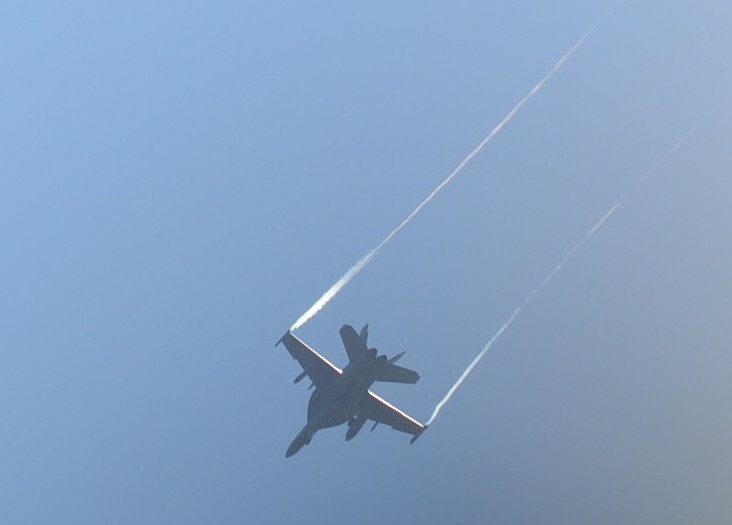 If you want to see what this exercise (and these planes) is like up in the air, have a look at this ABC video where the journo is airborne in a RAAF F/A-18. Way cool to a plane junkie! Oh, BTW, that noise is quiet compared to yesterday afternoon at our place. 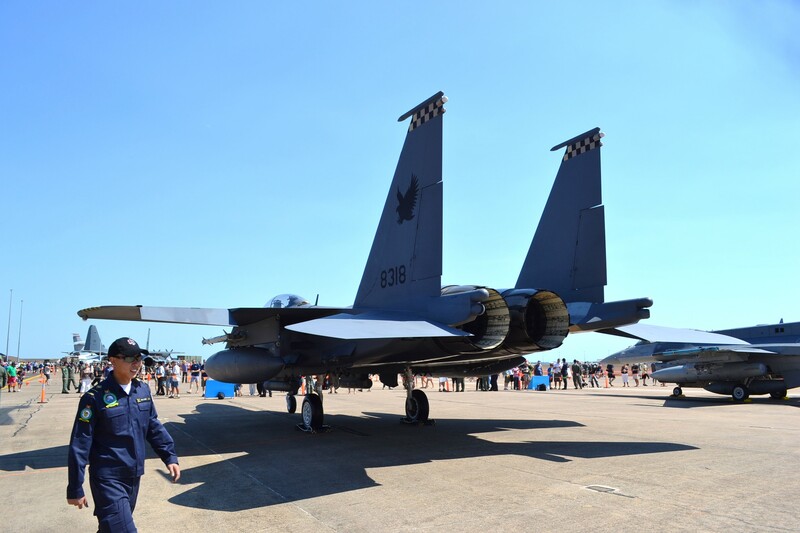 The Russian-made Sukhoi SU-30 jet flown by the Indonesian Air Force has generated a lot of interest since it arrived in Darwin a couple of weeks ago. As you can see there was a photo shoot going on last Saturday at the Open Day. Sukhoi SU-30 with an older model SU-27 Sukhoi behind it. 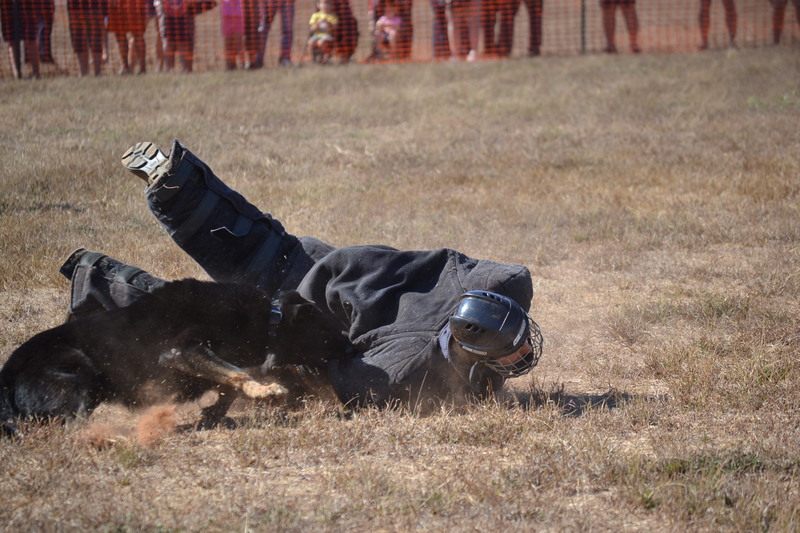 My other post gave an example of what happens when you mess with a Military Working Dog (MWD) on duty. 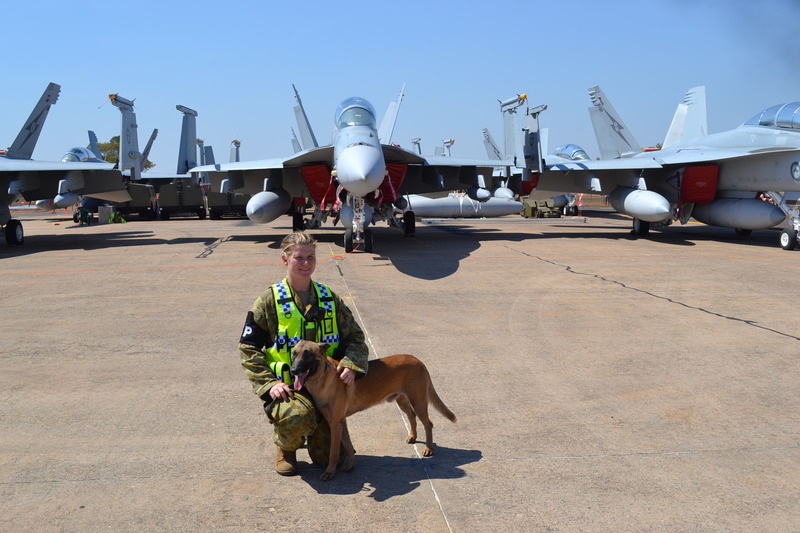 One of the things I noticed was that two of the handlers were women and later while looking around the aircraft we saw LACW Bowden with MWD Rocco on duty patrolling the RAAF’s F/A18-F Super Hornets. She kindly gave me permission to take their photo for this blog and we had a chat about being a MWD handler. Rocco is a Belgian Malinois. I think it was Rocco in the other series of photos and also LACW Bowden with the puppy-in-training. I’ve never seen these dogs in action before and I was so impressed (can’t you tell?). 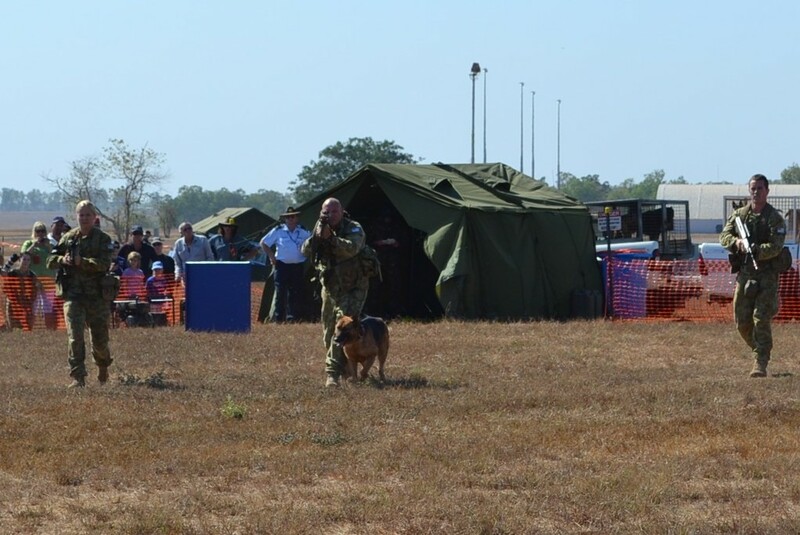 LACW Bowden and MWD Rocco on duty. 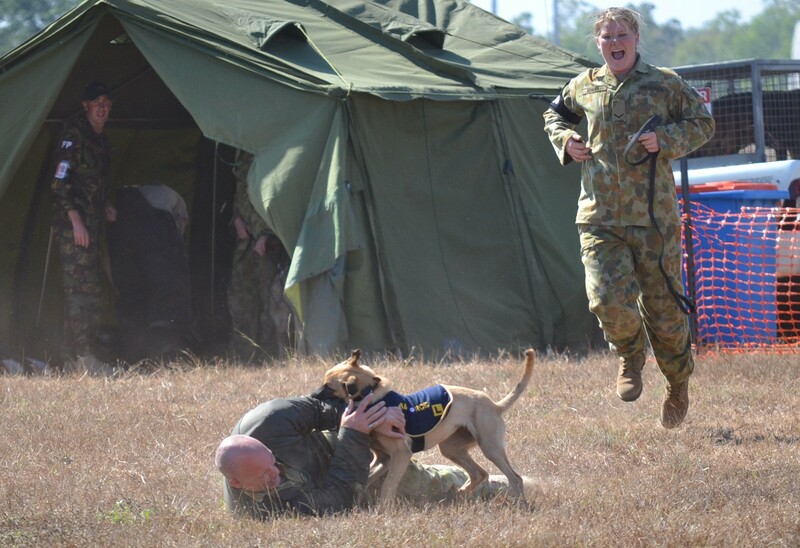 It must be devastating if something happens to either the MWD or its handler given the closeness of their bond. You can listen to another handler talking about it here during Pitch Black 08. 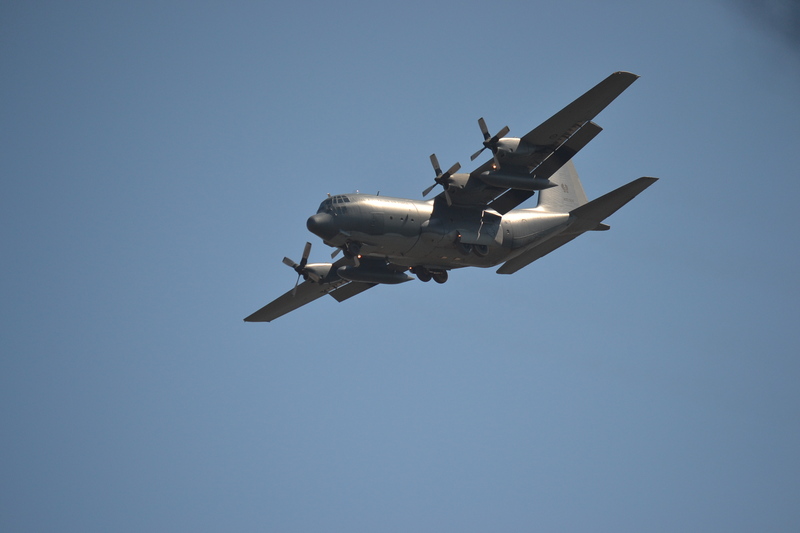 The RAAF Hercules was generating a lot of interest from the crowd. Master Nearly-6 was thrilled to be able to have a look inside. Interior view of the Hercules. 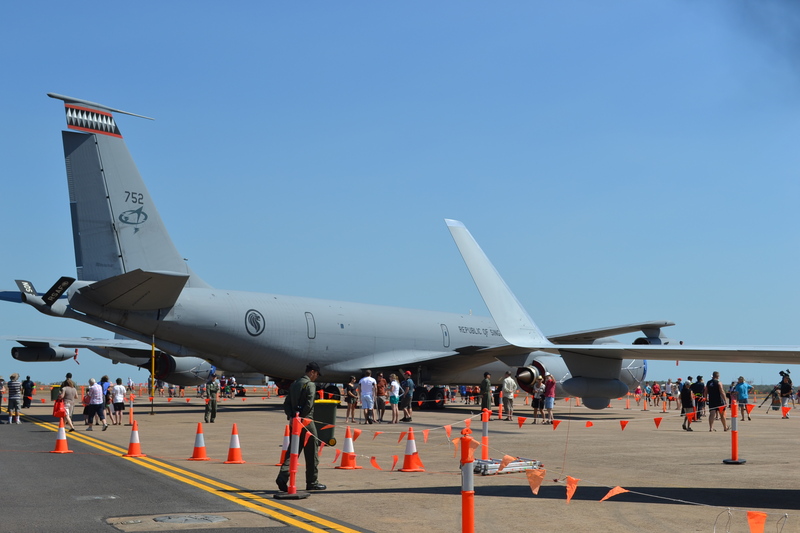 Republic of Singapore Air Force KC-135 Stratotanker with the RAAF’s AP-3C Orion behind it. 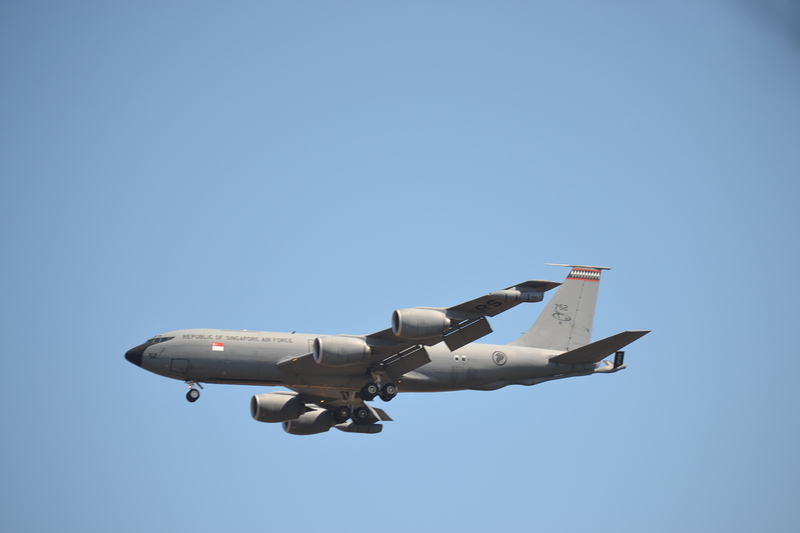 The KC-135 is their mid-air refuelling tanker. 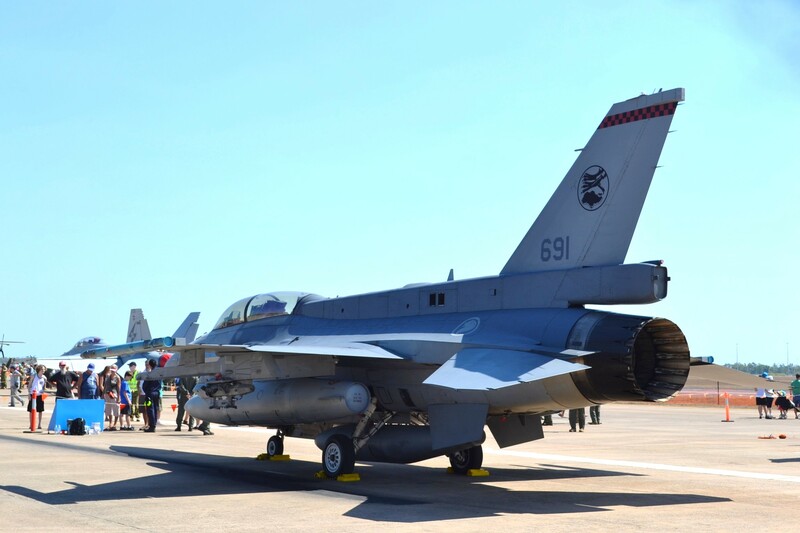 Republic of Singapore Air Force F-16 Fighting Falcon. 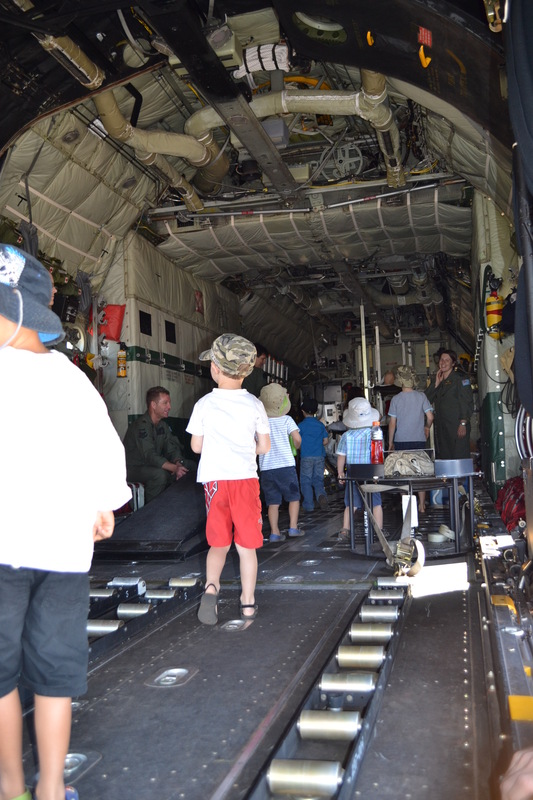 Young (and not so young) boys were having fun checking out the APCs and the Army’s weaponry. 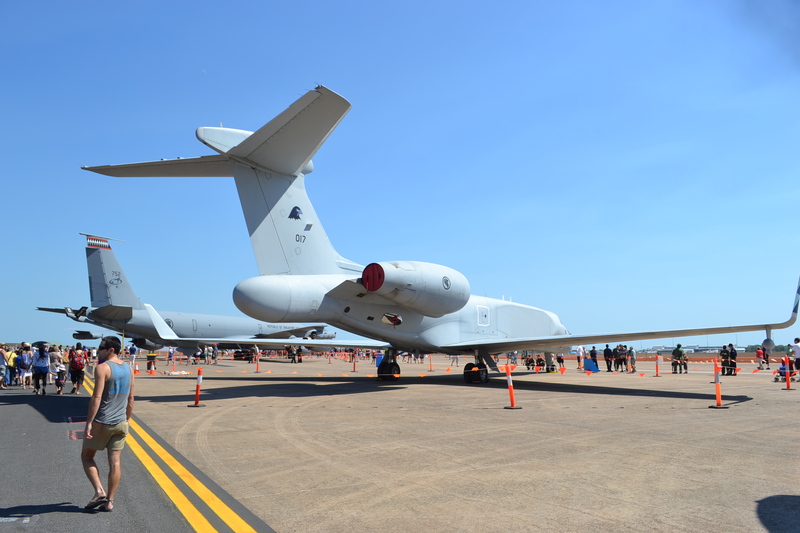 Earlier in the week I talked about the RAAF Open Day, and highlighted the aircraft and the pilots. 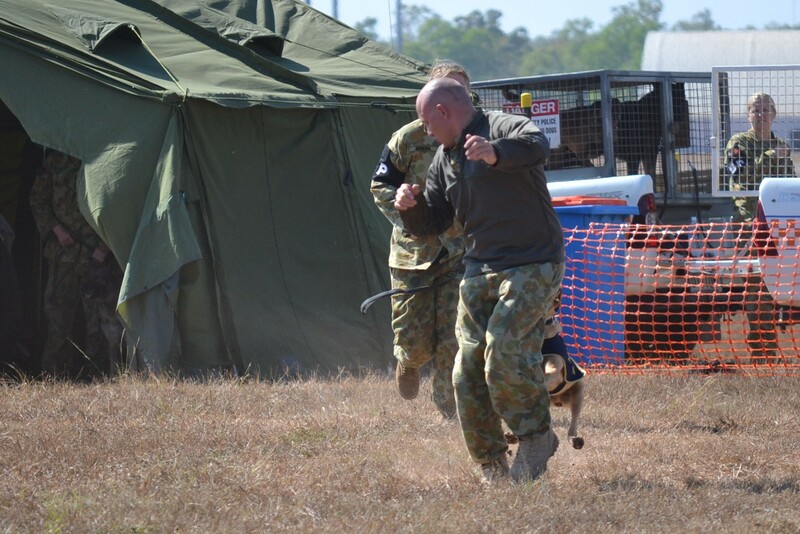 We also saw a great demonstration of the Military Working Dogs (MWD) on attack. 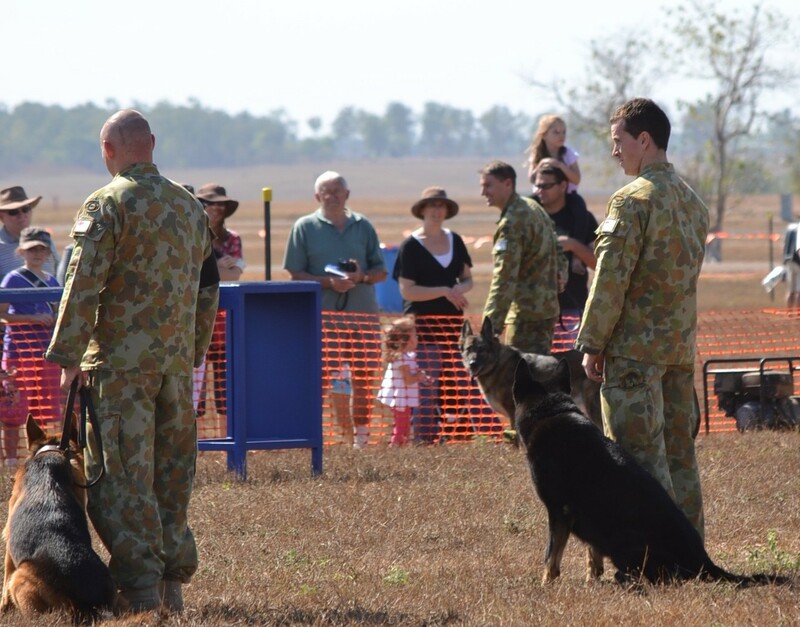 Their role is to defend the security of the RAAF bases but they also go on some overseas postings with their handlers. 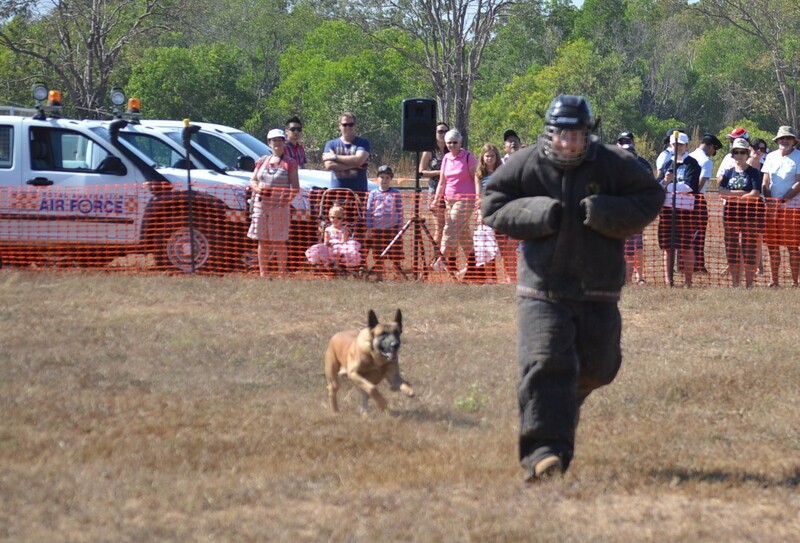 The MWD nearest the orange fence (mid-picture), is retiring after 12+ years service. Good and faithful work! Kitting up for the attack. The extent of protection shows that these dogs mean business. Kicking up dust and bringing him down. Apart from being impressive I can tell you those dogs are very scary. You absolutely would not want to be the subject of their aggressive attention. Basic fact: the dog’s back teeth 5 times as much pressure as is required to break human bones. Despite being kitted out with safety gear, the “offender” must have had a few bruises on Sunday. You also can’t outrun them either! The dogs were very responsive to the handler’s commands and my observant husband noticed they always circled back round the handler before coming to rest/attention beside the handler (makes sense really). But as they were called off the cowed offender they did rather look like they’d have loved another go at him. Cries of “get him off, get him off did not deter the dog in the slightest. They are also trained to cope with the sounds of gunfire and to plunge through fire. 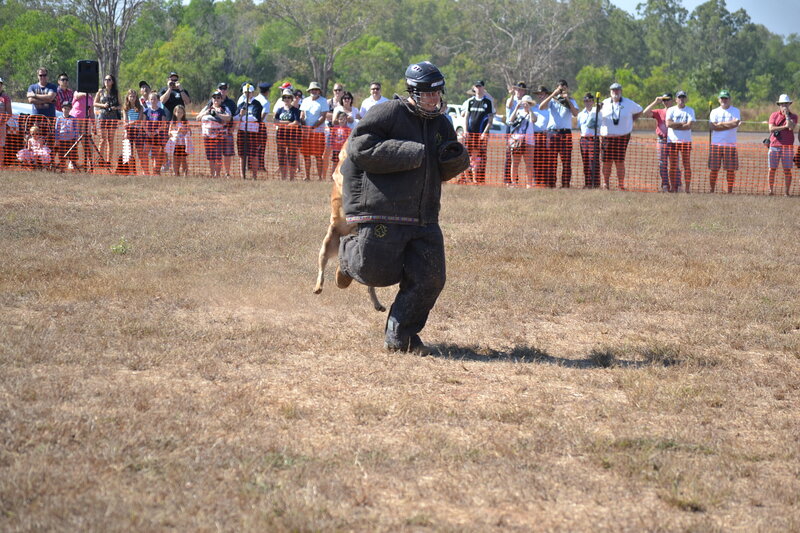 Different breeds have different attributes but they all seemed keen to bring the offender down. I kept thinking of my friend’s German Shepherd, Bear, who is incredibly intelligent. He’d have loved being a working dog if he’d been trained as a puppy. This little puppy is being trained..only a few months old from memory. Looks quite sweet doesn’t she? And she’s not letting go! She may look like she way playing, but she surely wasn’t. 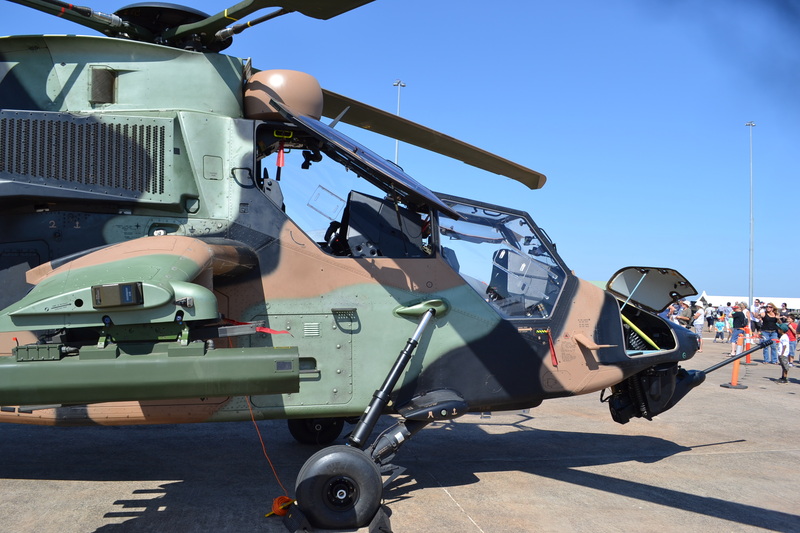 Among the fighter jets at the Operation Pitch Black Open Day on Saturday was an Australian Army ARH Tiger helicopter. These are “attack helicopters used in armed reconnaissance missions”[i]. Tiger Pilot, Captain Overton, was talking informally with the public about its sophisticated weaponry and had all those listening enthralled with his comments and information. I was intrigued that the cannon responds to the pilot’s head movements thanks to a link with the helmet he wears: look right and the weapon moves right etc. 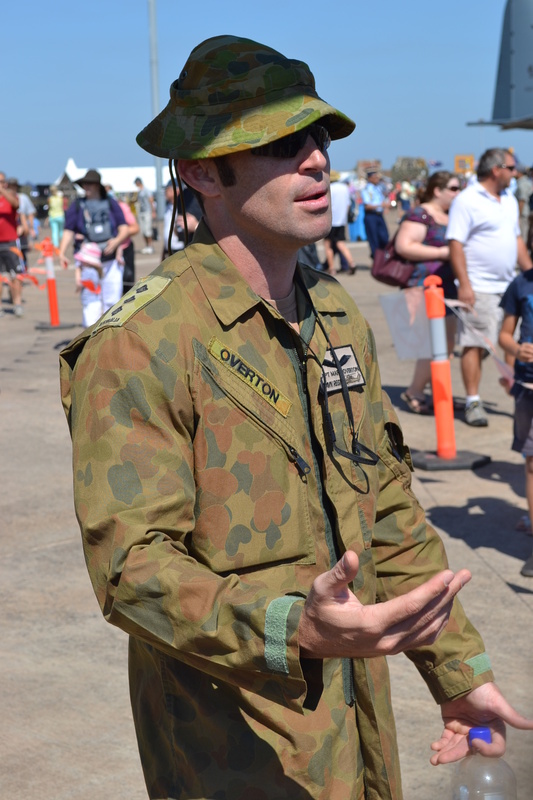 Tiger pilot, Capt Overton, talking to the public about the attributes of his helicopter. 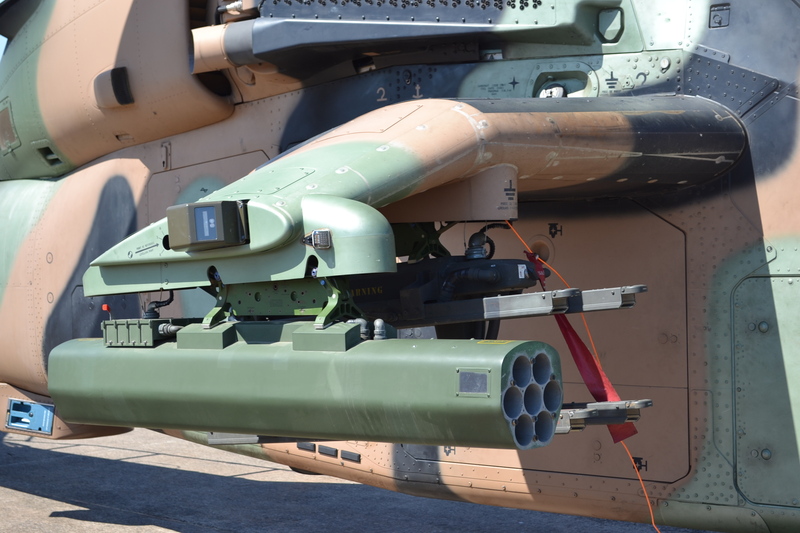 Apparently the Tigers are the most lethal helicopters around and can destroy almost any tank in the world: if you’re going to go into battle you want one of these on your side, you surely don’t want them up against you. The 30mm cannon, rocket launchers, and laser-guided hellfire missiles with an 8km range make for a formidable military combination. I was equally impressed by the calm confidence of all the Defence personnel we talked to. They are so capable at what they do without any brashness and bravado, just extreme competence. 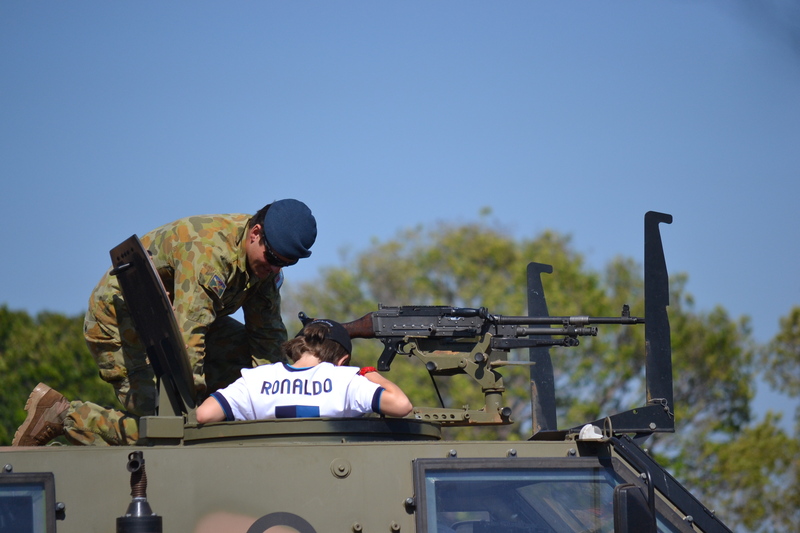 I wonder how many enlistments the Defence forces get after an open day like this one, a few I reckon, especially in a city like Darwin. If you’re into aircraft do go and look at the link below. Click on the yellow circles to see the details and also turn the image to get a side view. You can also see more about it in the video. All very cool! It also enlightened me on the difference between a battle captain and the pilot (click on the down arrow beside the people images). 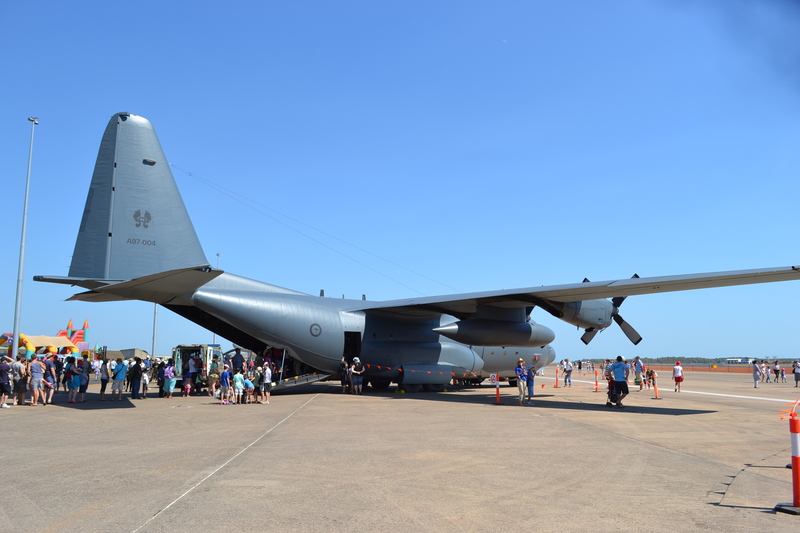 What a top weekend we’ve been having here in the Top End and yesterday ‘s RAAF Open Day was a highlight! 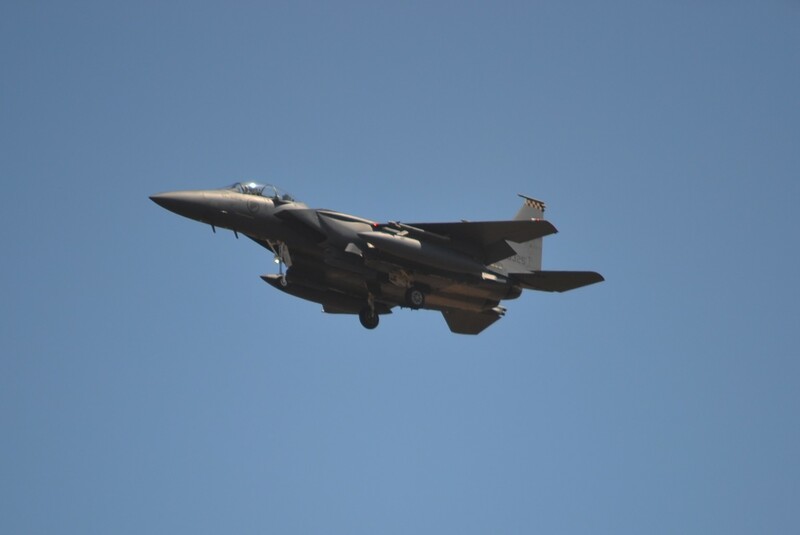 I forgot the temporary aggravation of military jets zooming overhead and remembered just how much I love them. There were 21 aircraft on display from the various countries participating in Pitch Black 12, and it’s probably unusual to see this variety in one place. Mr Cassmob and I were in heaven and it was such a thrill to be able to see all these amazing aircraft up close and personal. I must have been hyped up because I was cheeky enough to bail up a passing RAAF Pilot and ask him for a photo opportunity. 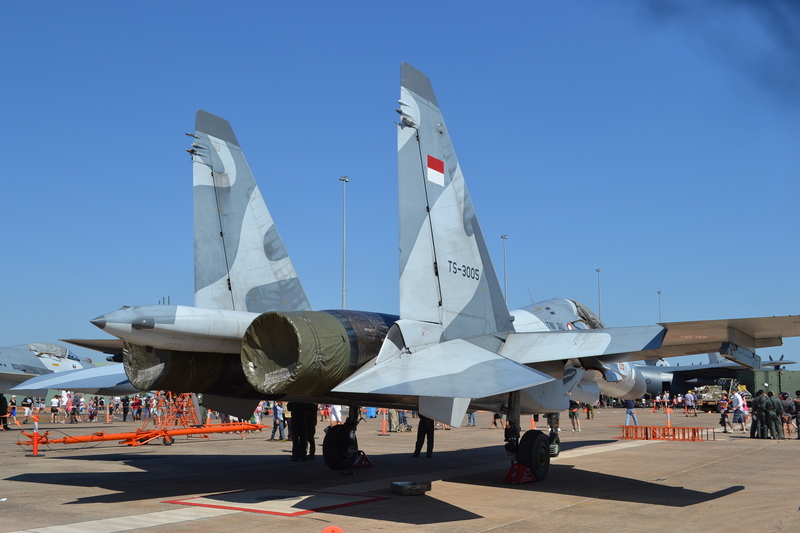 He graciously agreed to be photographed for my blog in front of this RAAF F/A18-F Super Hornet fighter jet. 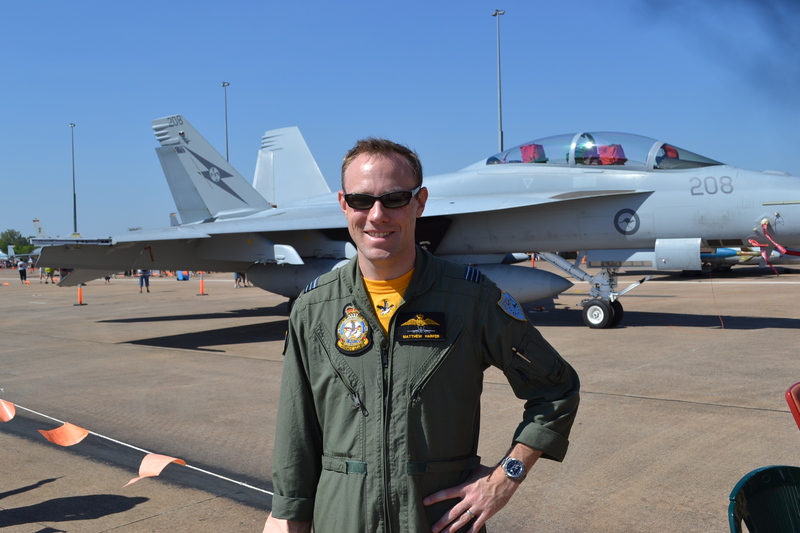 Squadron Leader Matthew Harper in front A RAAF F/A-18F Super Hornet on the apron at Darwin’s RAAF base. Little did I know until I did some research this morning that I had photographed one of the RAAF’s crème de la crème, a genuine Aussie version of a “Top Gun“. Squadron Leader Matt Harper is one of the few foreign pilots who has trained on the USA Air Force’s super stealth aircraft, F-22 Raptor. Do click on the 1st link to read his story…just as well I didn’t know all this or I’d have probably gushed embarrassingly. Sqn Ldr Harper also generously came and talked to our grandchildren including Master 3 who had been so terrified by the aircraft noise last week. Thank you so much Sqn Ldr Harper for your time and courtesy. 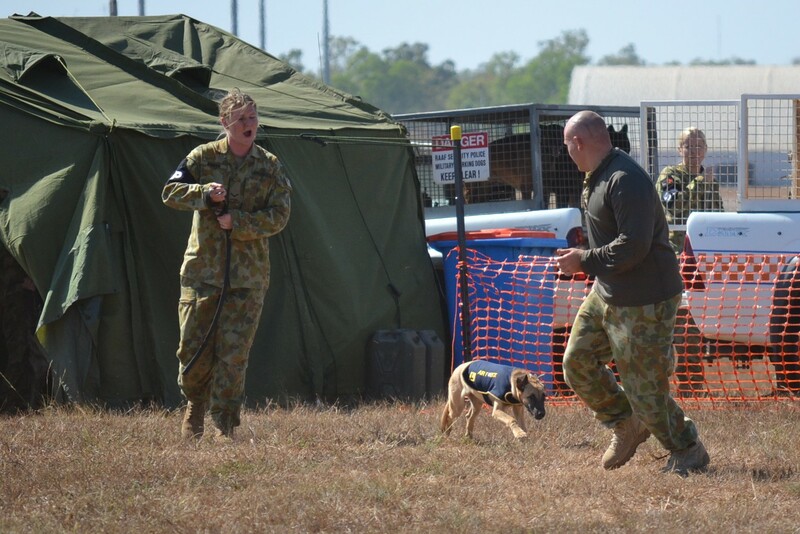 What a great job of PR the RAAF did yesterday! There’ll be several more posts about yesterday’s Open Day coming up this week. If you love aircraft, do drop by for a look. Images from Week 1 of Pitch Black 12 are here. If I happen to make any mistakes in these posts please do jump in and make corrections – I’m not an expert even though I enjoy seeing the aircraft. Operation Pitch Black has been in full flight (hmm) this week over the Top End and the sounds of military jets scream overhead. 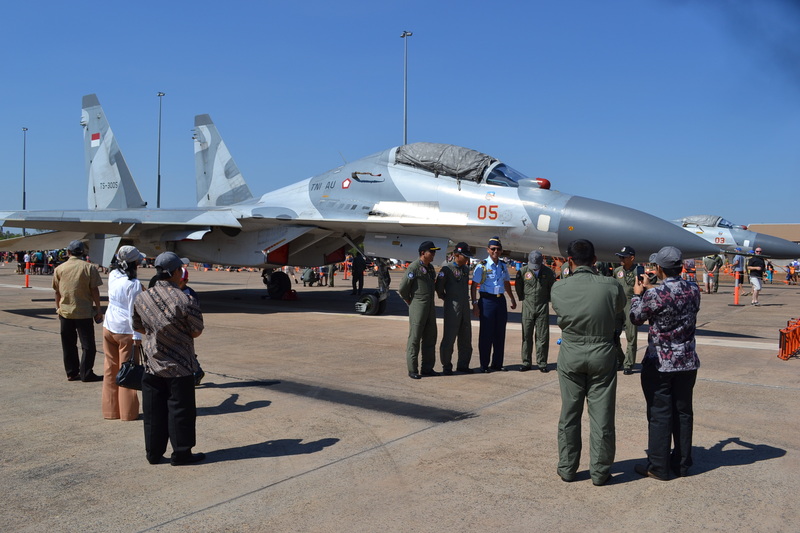 The exercise is a collaborative air combat training mission for air force pilots from six nations: Australia, New Zealand, Singapore, Thailand, USA, and in 2012 for the first time, Indonesia bringing their Russian-made Sukhoi SU-30 fighter aircraft. 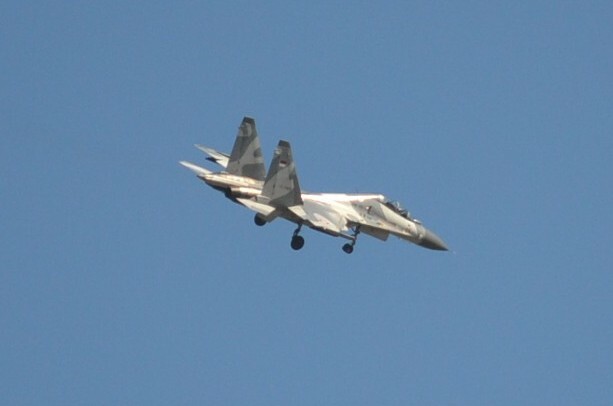 I’m pretty sure this is the Sukhoi jet brought over by the Indonesian Air Force. 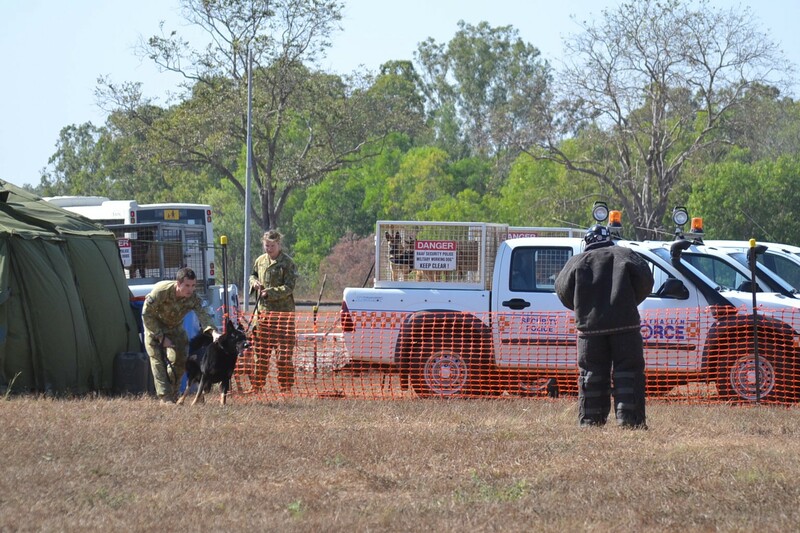 Luckily for us the aerial combat missions (aka dog fights) occur in open country south of Darwin with jets also taking off from Tindal RAAF base south of Katherine (300 odd kms from Darwin). You can hear Group Captain Mike Kitcher talking to the ABC about the exercise here: he’s the man in charge of the 100 aircraft and 2200 personnel who are taking part. 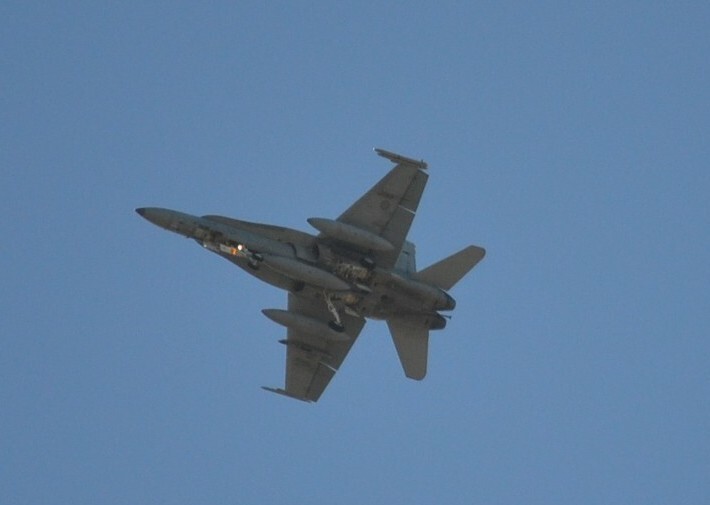 We’re used to the sound of the RAAF’s F/A 18 Hornets overhead from time to time but this is a whole other level. Why Darwin? We’re at the Top End of the country and in many ways the top end of Australia’s military defences; it’s perfect weather here in the Dry with an almost non-existent chance of rain; and we’re very much in the South-East Asian region. 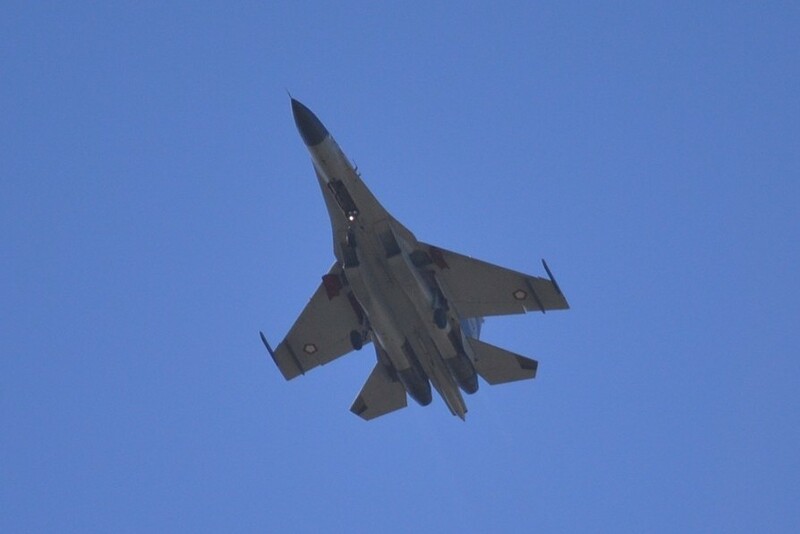 A Hornet (I think) from below. For the past week we’ve had practice sorties with small groups of aircraft up at one time. In the coming weeks they’ll have up to 60 aircraft up at a time….I can hardly wait. Hopefully there’ll be more photos coming up. I’m sure it’s a fantastic training experience for all the personnel involved, but I’ll bet it’s like Heaven on a stick for them too. Streaming contrails from the wingtips. 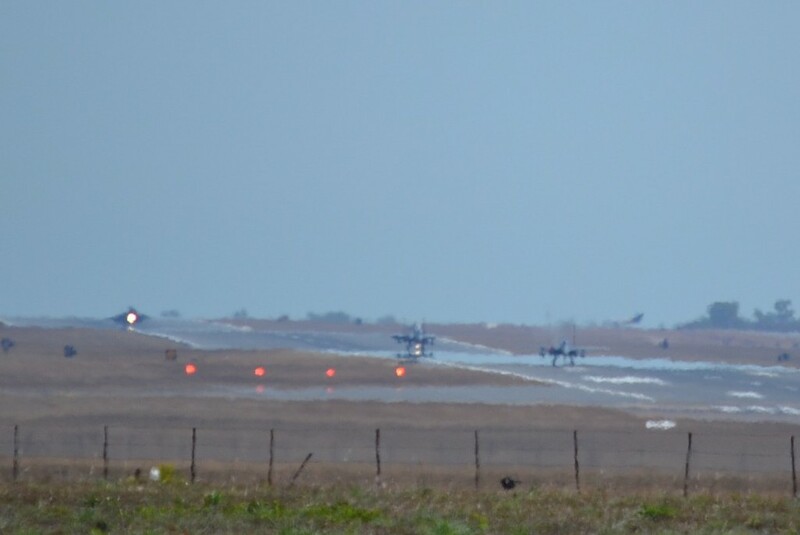 Here are a couple from the Amy Johnson end of the runway: a little fuzzy because of the dust and I’ve cropped it after using a long lens. Three fighters on the runway as they finish a sortie. The rear one is just flaring on touch down. 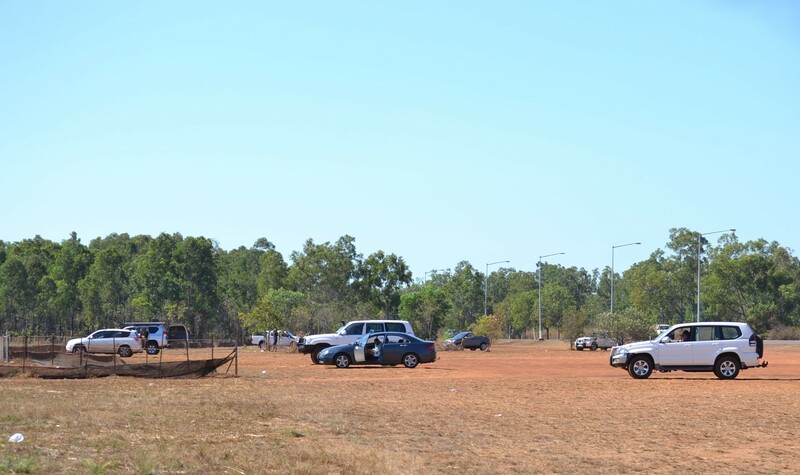 Darwin airport is a combined light aircraft, commercial and military airport. No doubt everyone is having to make compromises on timing. As I sat at the Amy Johnson viewing end of the runway, a string of bigger aircraft waited for a twin engine plane to clear the airspace. As the jets took off they left the stereo-typical swirl around them, but sadly it was just too far for my lens to capture. Jetstar (right, commercial flights), two fighter jets and an Air Force freighter of some sort wait their turn in the flight queue. 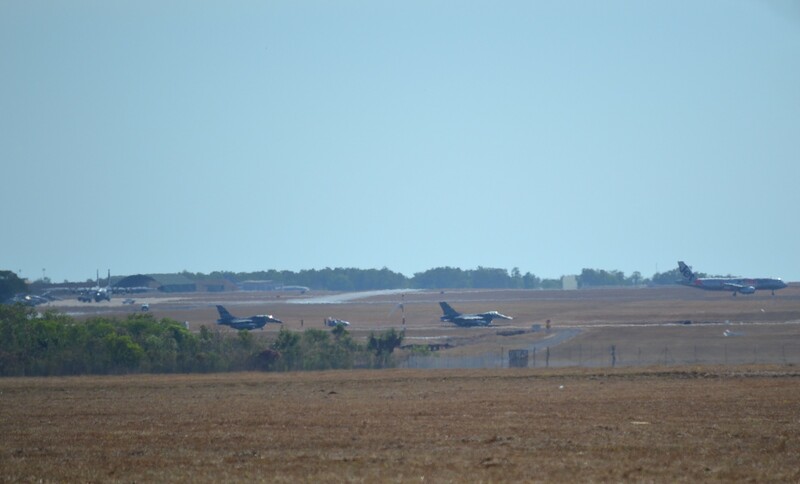 Watching the jets is a bit of a hobby in Darwin as you can see.